2 columns. Written Area: 90 x 161mm. Number of Lines: 10. Column Width: 70mm, column 2 of damaged side is 74mm. Column & line rulings in lead (?) Rubrication. 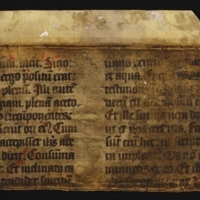 First Lines: (recto) scriptura dicit sicio, (verso) iudeis sepilire erat autem. 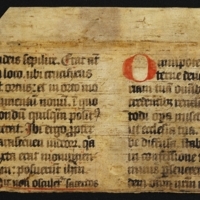 Liturgical Minuscule. 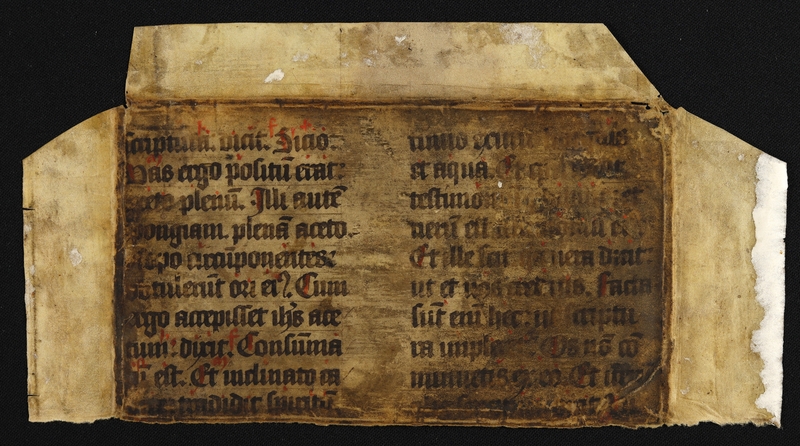 Last Lines: (recto) too damaged to read, (verso) ...dem dominum nostrum ihesum cris-. Content: Missal. Part of the Good Friday mass. Included are: John 19:28-20.22 (scriptura dicit sicio - tradidit spiritum), John 19:34-19:37 (-tinuo exiuit - Et iterum), a mostly worn away line where one can see scrip of scriptura, John 19:40-19:42 (iudeis sepilire - posuerunt ihesum), and the collect Omnipotens sempiterne deus qui gloriam tuam omnibus (part of the Good Friday mass). Have Rosenthal's notes ('Manuscripts from the Collection of Professor Bernhard Bischoff', p. 5 no. 16, from Colker's notes). 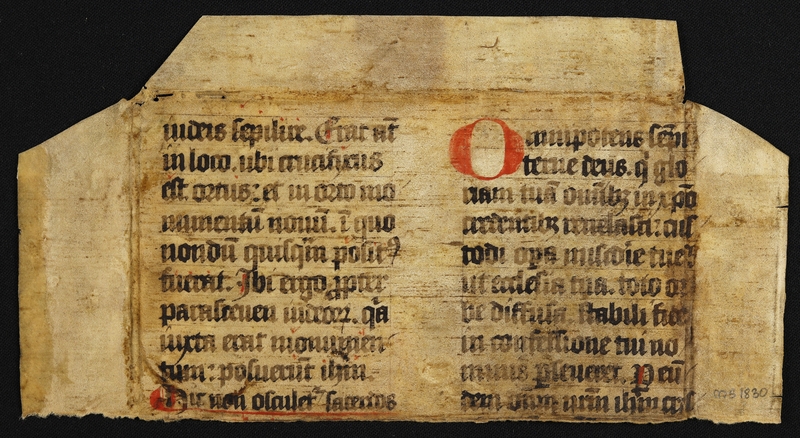 Physical Size: Portion of a vellum leaf (121 x 228mm).